If you are currently church-shopping, dissatisfied with your current church, or considering ways to serve your church, I’d encourage you to read this book. Really, if you’re a Christian, you’d do well to read it regardless. As the title suggests, the focus of this book is to give you biblical criteria by which you can identify a healthy church, and things to do as a pastor (or church member!) to encourage growth in your own church. It does this in three parts, first outlining what a healthy church is. Dever goes into how important being connected to a church is if you are a Christian, why he can’t verify your salvation if you don’t attend, what a Christian is–he goes into basic stuff, but ties it together in ways you might not have been prepared for. The other two parts cover nine “marks” of a healthy church, divided into two groups: essential marks and important marks, differentiating between those which the church’s health depends on more directly, and those which the church should strive to when it already has the other three. While the book definitely has some weighty sections, Dever’s writing style is easy to understand and the chapters are short, with subsections organizing things as you come to different points. Considering the book is only about a hundred and thirty pages, it’s a quick read. The essential marks are expositional preaching, biblical theology, and a biblical understanding of the gospel, while the important marks range from biblical church discipline to a biblical understanding of conversion. Throughout the book, Dever also stresses that these are not merely concerns for pastors and elders, but that God holds the congregation itself responsible for the health of their church, as is shown over and over in the Epistles. If you’re getting the idea that Dever is very concerned about what the Bible has to say on how we “do church” and worship and serve God in that context, you’re right. There are references to passages of Scripture framing each mark presented, encouraging you to search these things out in the Scriptures yourself. I appreciate Dever’s attitude as he lays forth these marks, humbly affirming that while the book is by no means exhaustive, it is meant to be informative; and the many Scripture references and quotes throughout show that the author is concerned with retaining a Biblical perspective, and showing readers that the Bible has more to say about church than they may realize. 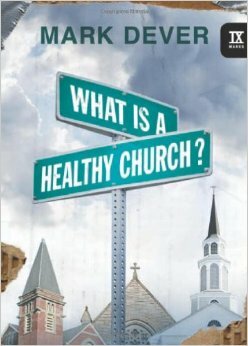 So what is a healthy church? This book will help you answer that, and a few other Church-related questions. No matter your current situation, this book will be a challenge and encouragement to you.